I plan to work on the art for "Serenade" throughout the month, so expect posts with lots of pictures! This past week I worked on the very first scene of the game and its related background art. The game is set in 2012 Japan, half in Tokyo, half in a fictional city called Kujikawa. First part of the game (and the demo I plan to release as soon as I can) is set in Kujikawa, which is an average and tranquil city. Still, it has some peculiar locations directly linked to the very story of "Serenade". As I always complain on my twitter, background art is a thing I'm weak at. 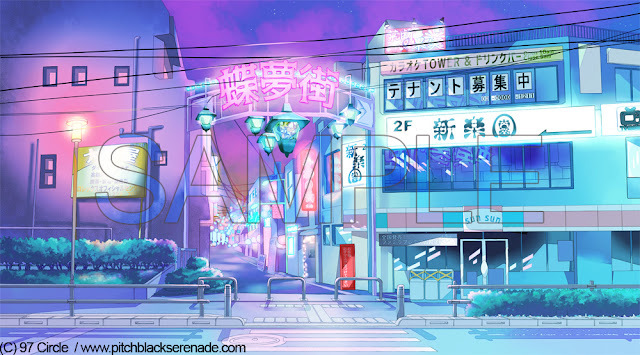 I'd need a big amount of time to produce something decent, and since at the moment I'm the only artist of "Serenade" and I also have a full time job, I'm very short in time. So I've found some methods to overcome this problem. The first one works for indoor backgrounds only and I'll probably cover it up in another post (it involves 3D by the way), the second one is the method I came up with to paint outdoor backgrounds, which I think I'm not able to do otherwise. It contains photographs and relative linearts, that are free for use even for commercial works. It comes with a cd-rom with high res photoshop files as well, so it's really easy to use the linearts to make your own pictures. 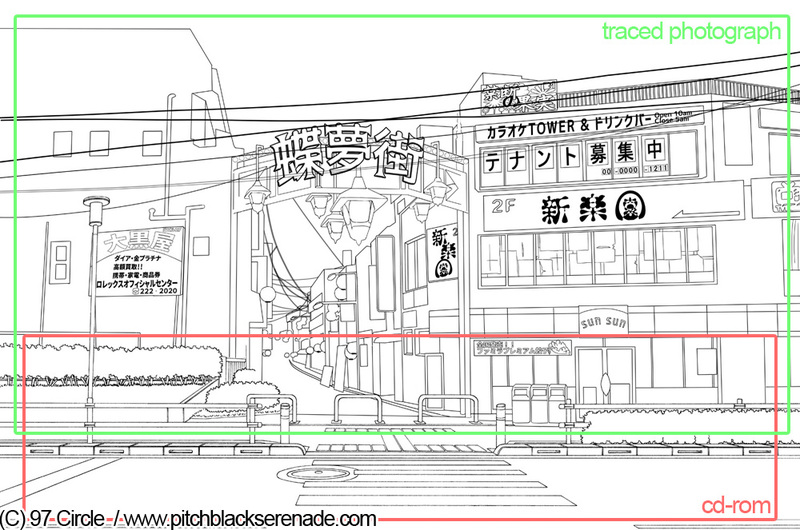 So, for this time I used half of a lineart provided from the cd-rom and for the rest of my canvas I traced a photo of an alley I took previously (I traced it with Sai tool for technical lines). Then I added some original items to customize it. The result looks like manga art, which is nice. And this also saved a lot of time! Lastly, I've been working as well on the host of Choumugai, a character called Cry, always wearing a crow mask. I think I'll write more about him when his sprite is completed. Next week (7-15) I'll be working on a new textbox (not fully satisfied with the one I'm using now) and I'll outline MC sprite.